Spatializing Law: An Anthropological Geography of Law in Society focuses on law and its location, exploring how spaces are constructed on the terrestrial and marine surface of the earth with legal means in a rich variety of socio-political, legal and ecological settings. The contributors explore the interrelations between social spaces and physical space, highlighting the ways in which legal rules may localise people's rights and obligations in social space that may be mapped onto physical space. This volume also demonstrates how different notions of space and place become resources that can be mobilised in social, political and economic interaction, paying specific attention to the contradictory ways in which space may be configured and involved in social interaction under conditions of plural legal orders. 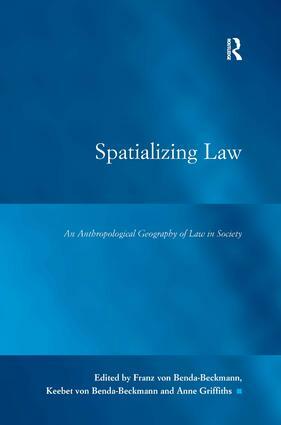 Spatializing Law makes a significant contribution to the anthropological geography of law and will be useful to scholars across a broad array of disciplines. Contents: Space and legal pluralism: an introduction, Franz von Benda-Beckmann, Keebet von Benda-Beckmann and Anne Griffiths; Peasant community and territorial strategies in the Andean highlands of Peru, Monique Nuitjen and DavÃ­d Lorenzo RodrÃ­guez; Migrants, settlers and refugees: law and the contestation of 'citizenship' in Bhutan, Richard W. Whitecross; The spatial and temporal role of law in natural resource management: the impact of state regulation of fishing spaces, Melanie G. Wiber; The sultan's map. Arguing one's land in Pasir, Laurens Bakker; Contested spaces of authority in Indonesia, Franz von Benda-Beckmann and Keebet von Benda-Beckmann; The new global legal order as local phenomenon: the special court for Sierra Leone, Gerhard Anders; The myth of the transparent table: reconstructing space and legal interventions in Scottish children's hearings, Anne Griffiths and Randy F. Kandel; The regulation of commodity exchange in Southern Africa during the 8th to 15th centuries CE, Edwin N. Wilmsen; Can there be maps of law?, Maarten Bavinck and Gordon R. Woodman; Index. To speak about law is always and necessarily to be engaged in a discourse about both justice and power. While law's relationship to justice is everywhere contingent and uncertain, law completely divorced from power is unthinkable. And, while law need not be virtuous to be law, if it had no effect in the world it could hardly be said to merit the name law. Recognizing these facts, the series on Law, Justice and Power takes a broad view of legal scholarship.It publishes books by social scientists, humanists and legal academics which connect an understanding of culture's normative ideals with examination of the complex ways that law works in the world, insist that justice is inseparable from social practices and analyze law as one form of power, one way of constituting, controlling and changing the social world. It focuses on state law as well as law in communities and cultural practices and on identities and their articulation in and through law, on law's power in the taken-for-granted world, on its role in the complex construction of nation and national power and on global developments which today destabilize and transform the meaning and significance of law. The series invites innovative scholarship that crosses disciplinary as well as geographic and temporal boundaries.